CVS is apparently expanding its work at home workforce. We are seeing more Customer Service Representative positions, for example, in addition to the work from home Nurses and other roles it has listed in the past. The expansion of remote jobs indicates that CVS is seeing the advantages of having home-based employees. Higher productivity, lower turnover, greater customer satisfaction (happier employees make for happier customers) — along with the environmental benefits — all argue for telework. And with more and more companies offering home-based employment, CVS and others have to do the same, or lose quality job applicants. A recent search of CVS’s jobs base produced work from home openings including Customer Service Representatives, Customer Care Supervisor, Pharmacy Technician, Registered Nurses and more. However, CVS’s job search engine isn’t optimized for work from home searches. Keyword phrases like work from home (without quotes) turn up work from home jobs, but also thousands of on-site results. Adding quotes or other terms like telecommute and remote doesn’t work well either. Since many of the jobs are location-specific, you may want to search by location, or use the advanced search option to tailor further. If you don’t see a work from home job that fits you now, you can use the Job Alert Notification option (scroll down on right on job search results pages) to have future jobs sent to your inbox. 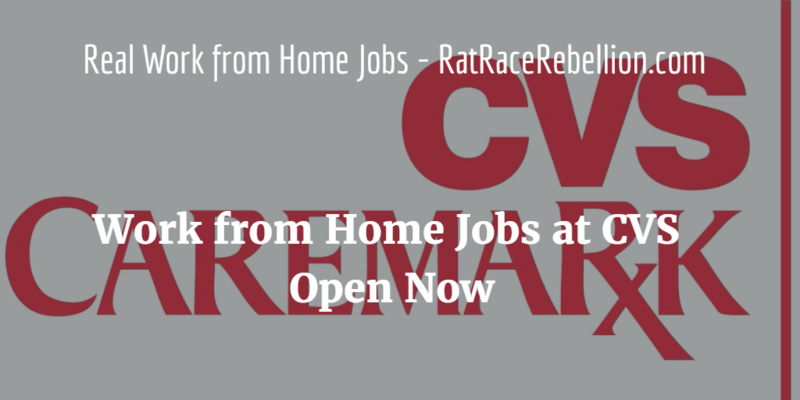 If present trends continue, more options may soon appear in CVS’s work from home openings, and we will post them to our Daily Jobs page as well. ♥ Share the love! If you know someone looking for a work from home job, please share this page. They’ll love you and we will too! Thank you! This entry was posted in Work at Home Jobs and tagged CVS. Bookmark the permalink.